Once a tooth has had endodontic therapy (root canal), a post and core buildup is generally the next step to restoring the tooth. During root canal therapy, the dentist removes the nerve and then fills the canal with plastic material and cement. Since the nerve is removed during endodontic treatment a post can be placed comfortably within the body of the root only in a tooth that has had previous root canal therapy. In fabricating your post we remove some of the plastic material from inside the canal making sure we leave the last two to three millimeters at the end of the root sealed. This space that is fabricated is necessary in order to anchor the post within the root of the tooth. The post is a metallic structure that is then cemented into the tooth and is a separate procedure from the crown. The part of the post that shows is called the core. Filling material, either composite or amalgam, is placed around the post to buildup the core of the tooth. This core then becomes our foundation for what we can anchor a cap or crown to. The crown (or cap) is then ready to be placed. 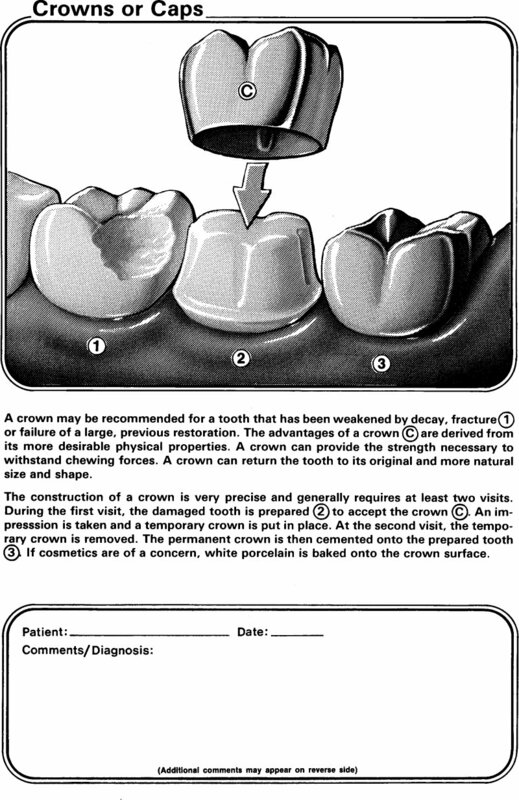 Although posts are usually recommended when there is minimal support for a crown, they are not always necessary. The use of a post will be determined on an individual basis based upon support and structural requirements.